Symantec® Enterprise Vault™ is an information archiving product used in many large organizations. It allows administrators to apply policies to collected data, while protecting and gathering information in a centralized repository. Enterprise Vault includes a Microsoft Outlook add-in. Outlook data is stored in the vault, and emails are replaced with a short text stub file. The Outlook mail list looks fairly normal, as only the first 100 characters or so are displayed in the expanded mail list. When an Enterprise Vault user clicks on an Outlook email message the content of the email is quickly retrieved from the vault, and displayed in a separate window. For all it's benefits, Enterprise Vault presents Outlook users with some difficulty while exporting emails in bulk. The MessageExport™ add-in by Encryptomatic® integrates with Outlook and Enterprise Vault. MessageExport allows users to retrieve emails from the vault so that it can perform bulk email export functions, such as saving vaulted emails in .pdf, .msg, .tiff and other useful file formats. Before exporting vaulted emails with MessageExport, you'll first to enter your credentials. 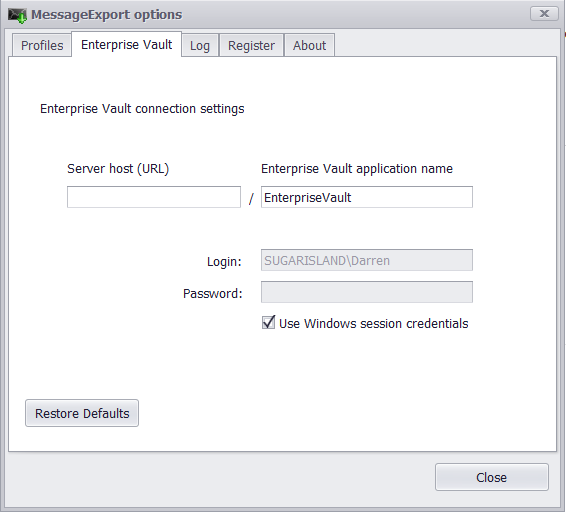 Enter the MessageExport settings and choose the "Enterprise Vault" settings. After the credentials are entered, you're now ready to export emails. The process for exporting emails is the same as a non-Enterprise Vault environment. Just select any email or Outlook folder, choose the export profile (such as Export to PDF) from the drop down list, and click the "Export" button. 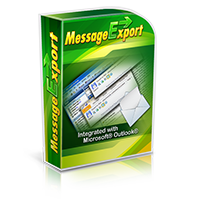 MessageExport integration with Microsoft Outlook. For more information on MessageExport, and a free trial, visit the product home page.